Tradition. I am from a Broadway musical loving family. I went to my first Broadway show (Annie) when Iwas in fourth grade and I have been lucky enough to have been afforded the opportunity to see many shows throughout the yearsWhen it was all the rage, my mother had the soundtrack of Les Miserable on an infinite loop in her house. My daughter apparently has the Broadway gene as well and so now in my own house there is ALOT of Hamilton, Lion King and Wicked. Given this deep seeded influence, is it no wonder that every time I hear the word “tradition” I actually break into the song from Fiddler on the Roof and I imagine Russian Jewish men dancing and singing? Tradition comes up a lot this time of year. It seems during the holiday season we stick to that which we know and love. It brings us comfort and it is that which brings us all together, reveling in memories of years past as we enjoy those same traditions in the present year. Nowhere is the need for tradition so strong than in holiday cooking. My mom and I discuss the Christmas dinner menu every year, as if it is going to change. It never does. I have a list of “must makes” for everyone: pickled eggs for my husband, biscotti for my mom, meringues for my daughter and our neighbor Jack B. And for the Turneys, my very NON Italian family, pizzelles. There must be pizzelles. This is a long standing tradition that came to me from my husband’s family. 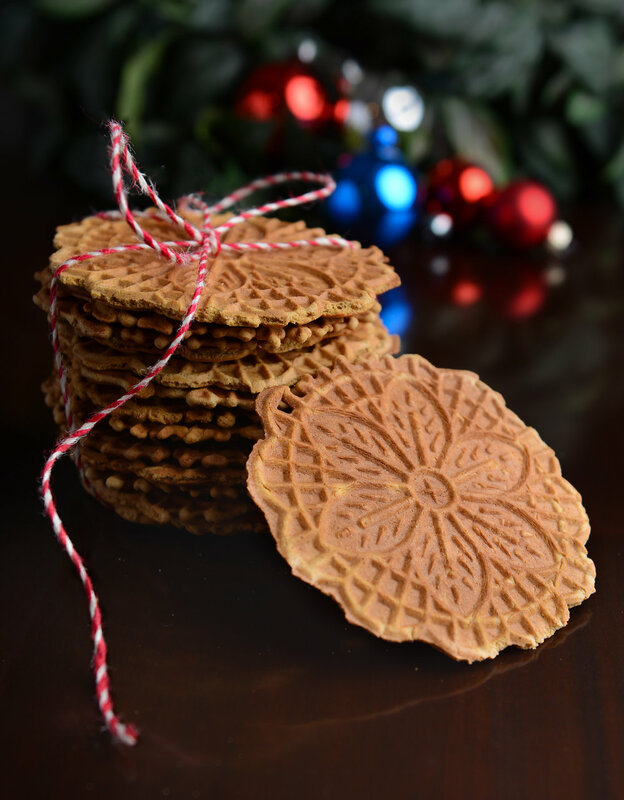 Of course I am always looking to put a little spin on the original so this year, in addition to the anise pizzelles (there is no way I can skip those) I will be making gingerbread pizzelles. The gingerbread flavors are a perfect compliment to these thin crunchy cookies. It’s like aperfect marriage of the English and Italian traditions. I think it may be a new addition to the repertoire. They are gorgeous dusted with powdered sugar and they also make a great gift. I have actually included them in my 12 Days of Edible Gifts with Italian Inspiration. You can sign up to receive those emails - one a day for 12 days- by clicking here. In a medium bowl, combine all the dry ingredients, stir to mix well. In a large mixing bowl, beat the eggs, brown sugar, molasses and coconut oil together. Add in the dry ingredients and stir to combine. Preheat a lightly sprayed pizzelle iron. Place a tablespoon of batter in the center of each pizzelle and bake according to the manufacturer’s directions. My iron cooks for about 75 seconds. (Don't worry if they are dark - the molasses and brown sugar make them a very different color from the traditional) Place the pizzelles on a cooling rack on the counter to cool. If they appear to be soft, second bake them on a cookie sheet at 350 degrees for 5 minutes. The texture should be crisp and light. Sprinkle with sifted powder sugar and store tightly closed. I hope all your traditions - new and old - bring you much joy and love in this wonderful season.